On arrival at Cochin International Airport, you are greeted and whisked away to historic Willingdon Island or to Fort Cochin.In Cochin, you may explore the ancient harbour, with its rich colonial past, the old spice market at Mattancherry, the antique shops on Jews Street, the Synagogue, the Dutch palace and of course, the famous Chinese fishing nets, St. Francis Church and David Hall. Harbour Cruise in the evening. Overnight at Cochin. You leave the coastal plain, traveling winding hill roads with plantations of rubber and tea to reach Munnar Bungalows.Not very far from Munnar town and more than 200 years away from today are nine distinct bungalows that hark back to the colonial legacy of tea plantations.These remote bungalows in forest settings offer guests a different way of experiencing Munnar, giving one access to a remote, pristine and yet untouched Munnar which is far removed from the expected and well away from the hustle and bustle of this busy little hill town.Overnight at Munnar Bungalows. After breakfast, full day at your disposal for various activities in Munnar which includes Guided Trek and Tea Museum visit.Overnight at Munnar Bungalows. After breakfast, drive from Munnar to Thekkady. Lunch at Spice Village. Engage in activities like cooking demonstration and cultural programme followed by dinner.Overnight at Spice Village. After breakfast, you will drive back down to the coast and this melodically named town of Kumarakom on the banks of Lake Vembanad. Here, you hop on to a boat to Coconut Lagoon, an eco-friendly resort created from restored heritage homes, set in a web of canals on the banks of the Kavanar river. Evening finds you on a sunset cruise on the lake, in a converted rice boat to a flute accompaniment. After cruise it is learning time.Learn to cook some authentic Keralan dishes in the cooking demonstration class organized by the Chef. 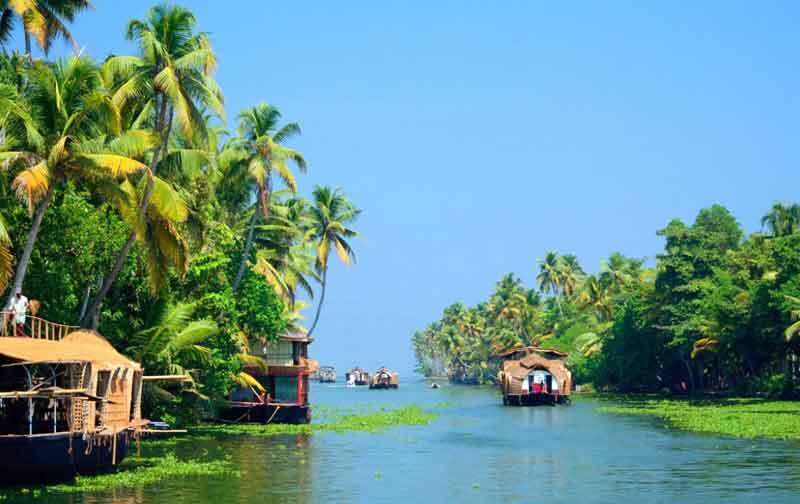 The resort gives an opportunity to see some traditional Art Forms of Kerala which is followed by dinner. Overnight at Coconut Lagoon. Another session of Yoga followed by breakfast. After breakfast, transfer by boat and then by road to Marari Beach.Check-in to an independent villa at the Marari Beach. Marari Beach resort is not just the sand and the sea. It’s the living environment that surrounds it.The Marari Beach, let us be clear, is not the place for a raucous Beach holiday.There are no real parties here. No noisy water scooter but for those seeking to undo the stress of the city life and experience a completely new place, it is the perfect spot. After lunch in the restaurant, it’s time to relax in the Coconut grove.Evening will be engaged in good music. Cooking classes followed by dinner.Overnight at Marari Beach. After breakfast, drive back to Cochin International Airport. Above rates are applicable to INDIAN NATIONALS. This offer is extendable on pro-rata basis. Kindly note that accommodation is in standard rooms at all properties. Transportation not included in this package,on request will give you separate cost.